Lions Head is a mountain in Cape Town, South Africa, between Table Mountain and Signal Hill. Lions Head peaks at 669 metres above sea level. 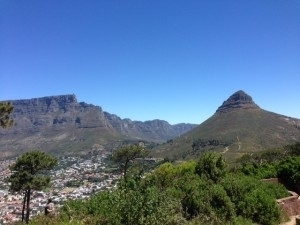 The peak forms part of a dramatic backdrop to the city of Cape Town and is part of the Table Mountain National Park. In the 17th century the peak was known as Leeuwen Kop (Lion’s Head) by the Dutch, and Signal Hill was known as Leeuwen Staart (Lion’s Tail), as the shape resembles a crouching lion or a sphinx. Lions Head is known for spectacular views over the city and beaches, and the hour-long walk to the top is extremely popular during full moon. 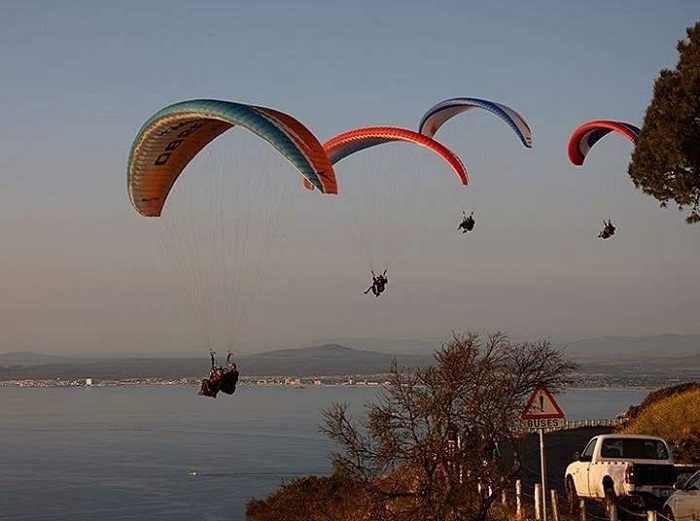 Its slopes are also a popular launching point for paragliders. We call Lions Head our office as this is where you will find us most days. Our pilots meet passengers at the Lions Head car park before walking 10 – 20 minutes to the take off sites. 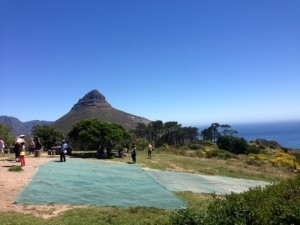 There are two take off sites on Lions Head, the first after the steep sand road as you go around the corner with Camps Bay Beach in view on the left, the second further along as you turn the corner and can see Robben Island, higher to the right. The take off site you will fly from depends on the wind conditions that day. You will paraglide over Camps Bay and Clifton, either landing on Camps Bay beach but more often landing on the grass in front of The Bungalow (the old La Med). After your flight you can enjoy a cocktail or a meal at The Bungalow. 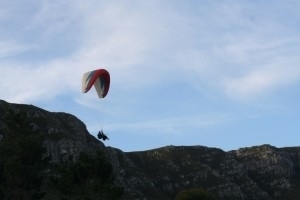 Standard paragliding flights are from Lions Head and Signal Hill in Cape Town and further out of Cape Town in Hermanus. 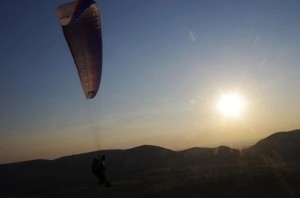 Cross-country paragliding flights are from Porterville and Sir Lowry’s Pass. In Hermanus you will land on the High School field. Cross-country paragliding flights you will land on any piece of open land after your long flight, a recovery driver will fetch you (don’t panic you won’t have to do a cross country walk back to the car). 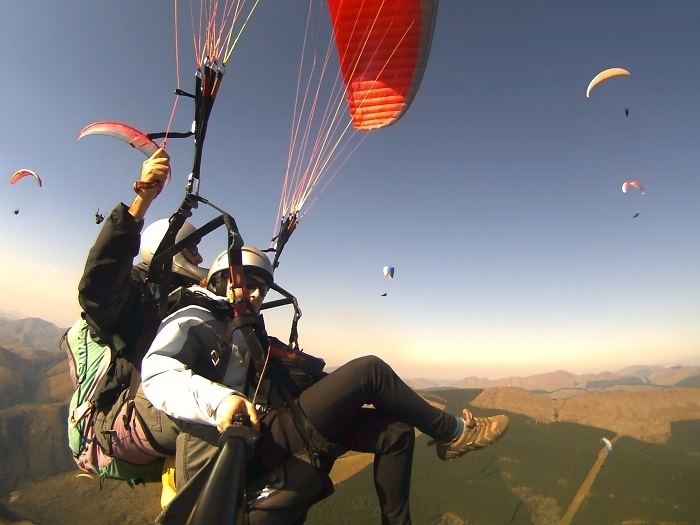 How long is a tandem paragliding flight? Who qualifies as a tandem paragliding passenger? Paragliding is an extreme sport, but you are in good hands with our pilots. All tandem pilots are highly experienced TFIs (Tandem Flight Instructors) certified by SAHPA (the South African Hang Gliding and Paragliding Association). You are welcome to use your own camera as long as you hold tight and your insurance policy is up to date, we cannot be held responsible for your camera being dropped a few hundred metres while we are doing a wing over with you. Friends and family are welcome to take photos during take off and landing. Your pilot will have a camera that is tightly strapped to his harness during the flight, you can buy the in-flight photos and video for R250. 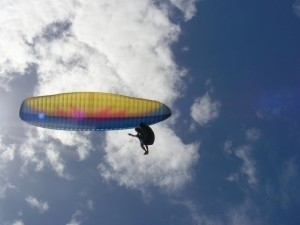 How much does a paragliding flight cost? You can pay with Payfast online, do an EFT, or pay cash or with Snapscan on the day. Please note we do not have a credit card machine on the mountain. Yes, you can arrange this with Jacques or Louise when making your booking. We can either email you a voucher or print a voucher for you. Please let us know if there is a special occasion that you would like us to help you celebrate. We can arrange 5 pilots per group, so yes you and your loved one, friends or family can all fly at the same time. This does not mean that you will all be flying in the same paraglider, might sound like a stupid answer but we have been asked “how many people can fly in that thing at the same time”, it is a tandem paraglider which means two people. Yes for groups of five people or more. Please enquire with Jacques or Louise when you are making your booking. Please note a 50% deposit is required for a group booking. If you have paid in advance and we can’t fly due to weather conditions we will happily refund you in full. Our pilots will dictate the weather conditions, you being under the weather from wine tasting does not qualify. Signal Hill aka Lion’s Rump, is a landmark flat-topped hill located in Cape Town, next to Lions Head and Table Mountain. The hill is also known as “The Lion’s Flank”. Together with Lions Head and Signal Hill look like a lion sphinx. It is known for the Noon Gun that is operated by the South African Navy and South African Astronomical Observatory. In 1836, a time ball was set up at the Cape Town observatory, however it was not visible to ships in the harbour, so a second time ball was erected on Signal Hill in order to relay the precise moment of 1pm Cape Mean Time. In this way ships in the bay were able to check their marine chronometers. The daily practice of dropping of the ball continued until 1934, when it was made redundant by radio signals. Our pilots meet passengers in the car park before taking off on the slope to the left of the car park. When flying from Signal Hill there are many spectators who are enjoying the views across Sea Point and Green Point having picnics or a quick photo shoot. 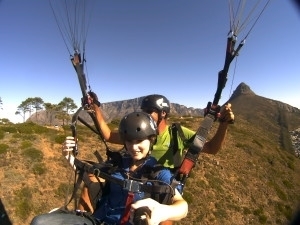 You will paraglide over Sea Point and Green Point with a great view of the famous stadium. Landings are either top landings, back on Signal Hill or on the famous Sea Point promenade. After your flight you can enjoy a cocktail or a meal at The Winchester Mansions. Hermanus is 130kms from Cape Town, depending on traffic an hour and a half’s drive. In the early 1800’s Hermanus Pieters, who was a shepherd and teacher, followed an elephant trail leading through the Hemel-en-Aarde Valley to the sea where he came upon a spring just to the west of the Mossel River farm. He found this to be an ideal spot to graze his sheep during the summer. He also spread the word to the farmers of the district. The spring came to be known as Hermanuspietersfontein but was shortened to Hermanus when municipal status was given to the town in 1904. Hermanus has the status of being the best land-based whale watching destination in the world. Southern right whales visit Walker Bay from June through to December and can be viewed from the air whilst paragliding. Hermanus is home to the world’s only Whale Crier who blows his kelp horn when whales are spotted along the central sea route. The take off is on Rotary Way. 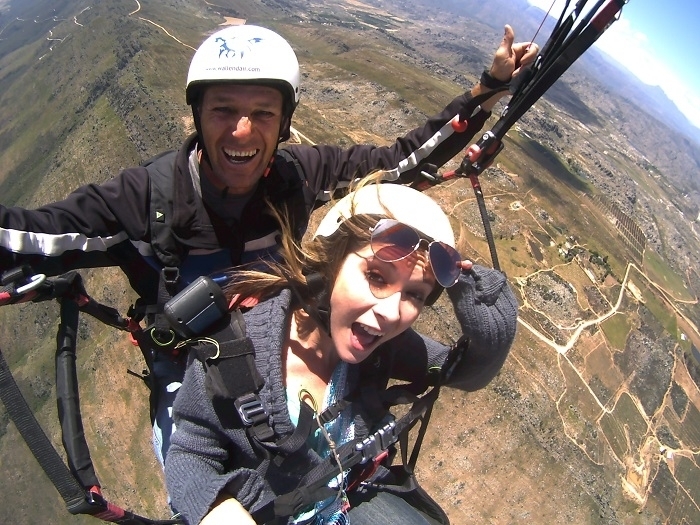 You will paraglide over the town of Hermanus, the views are breath taking, and a treat whale spotting from the air. You will top land on Rotary Way or land on one of the school fields below. There are many fantastic restaurants to enjoy a meal after your flight in the village. Sir Lowry’s Pass is a mountain pass on the N2 national road in the Western Cape, South Africa. It crosses the Hottentots-Holland mountain range between Somerset West and Grabouw on the main national road between Cape Town and the Garden Route. A railway line also crosses the mountain range at this point. The mountain crossing in that region was known by the indigenous Khoi people as the Gantouw or Eland’s Pass, and was used as a stock route. The Dutch and British settlers at the Cape built a rough pass called the Hottentots Holland Kloof Pass following the Gantouw route. The first recorded crossing was in 1664, and by 1821 the pass was seeing 4500 ox-wagons per year crossing into the interior, but the route was so severe that more than 20% of them were damaged. The ruts left by these wagons being dragged over the mountains can still be seen, and were declared a National Monument in 1958. The summit of the pass is at 420m. There is a viewpoint at the summit and this point is also used as a paragliding launch point. Baboons are often seen in this area.